Citation Information: JCI Insight. 2017;2(12):e95206. https://doi.org/10.1172/jci.insight.95206. The US continues to lead the world in research and development (R&D) expenditures, but there is concern that stagnation in federal support for biomedical research in the US could undermine the leading role the US has played in biomedical and clinical research discoveries. As a readout of research output in the US compared with other countries, assessment of original research articles published by US-based authors in ten clinical and basic science journals during 2000 to 2015 showed a steady decline of articles in high-ranking journals or no significant change in mid-ranking journals. In contrast, publication output originating from China-based investigators, in both high- and mid-ranking journals, has steadily increased commensurate with significant growth in R&D expenditures. These observations support the current concerns of stagnant and year-to-year uncertainty in US federal funding of biomedical research. Biomedical research publication output for the US and China from 2000 to 2015. 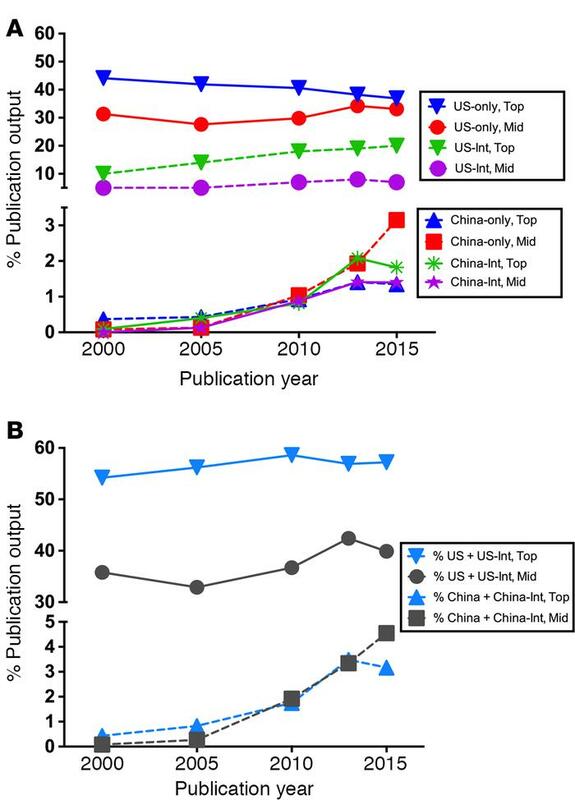 (A) The percentage of manuscripts originating from China or the US that include international collaborations has been steadily increasing during the past 15 years regardless of the journal impact (China: P = 0.03 for high-impact and P = 0.008 for mid-impact journals; US: P = 0.001 for high-impact and P = 0.05 for mid-impact journals). In contrast, the percentage of manuscripts that originated from US-based authors during 2000 to 2015 has decreased in high-impact journals (P = 0.007) or remained relatively unchanged for mid-impact journals (P = 0.28), while those originating from China-based authors has steadily increased in both high-impact (P = 0.02) and mid-impact journals (P = 0.04). (B) The percentage of manuscripts from the combined China-only authors and China-international collaborations has been steadily increasing regardless of the journal type (P = 0.001 and 0.04 for high- and mid-impact journals, respectively), while there has not been a significant change for the combined US-only and US-international publications for high-impact (P = 0.17) or mid-impact (P = 0.15) journals.